How should you celebrate St. Patrick’s Day? Traditionally, March 17 is the death date of Saint Patrick—the patron saint of Ireland. The cultural and religious celebrations often associated the day with four-leaf clovers, leprechauns, and pots of gold. Some people toast their friends in a bar with green beer. Instead, why not try a delicious St. Patrick’s Day soup? It’s liquid gold, aka extremely nutrient-dense variations of green soup that are very beneficial to your health. Many green vegetables and green foods contain phytonutrients such as flavonoids, antioxidants, carotenoids, and others that may benefit people with cancer, heart disease, and vision problems. Phytonutrients may also help reduce inflammation and blood pressure. The following are five green St. Patrick’s Day soup ideas to help keep you energized and motivated throughout the day. Spring is around the corner, so a more chill St. Patrick’s Day soup may be appropriate. This following cucumber and avocado soup is perfectly refreshing. Avocados are a perfect source of energy with lots of B vitamins and healthy fats, while cucumbers promote healthy digestion and weight control. 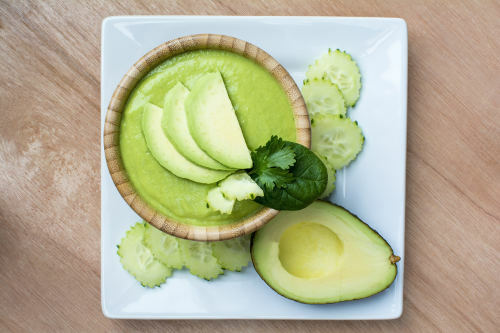 The following cucumber and avocado soup recipe is good for three or four bowls of soup. Place all ingredients in a food processor, and process until it is smooth and creamy. For a creamier texture, add more coconut yogurt, and garnish with slices of cucumber. Chill for 30 minutes before you serve. Kale is loaded with antioxidants like vitamins A, C, and E. Preparing this St. Patrick’s Day soup recipe with homemade bone broth is a perfect way to get important nutrients that are vital for bone health and digestion. The following kale squash soup recipe also contains healthy fat sources like hemp hearts, almond butter, and coconut butter. This makes the soup great for weight loss because the added monounsaturated fats can reduce weight, cholesterol, and other obesity-related factors. The following kale squash soup recipe will make eight servings and lasts up to a week in the fridge. It will last even longer if you freeze it. In a large soup pot, bring the broth and water to a boil. Add the onions, garlic, and squash, and reduce the heat to medium. Cover and cook for about 20 minutes, or until the squash is soft. Add the kale, and simmer for five minutes, or until it has wilted. Remove from the heat, and add the remaining ingredients (except for the hemp hearts). Using a high-speed blender, puree until smooth. Add the hemp hearts, and blend to desired consistency. Garnish with some extra hemp hearts. Pass the peas, please. The peas help give this recipe the rich green color. Green peas contain a unique phytonutrient polyphenol called coumestrol, which may reduce the risk of gastric cancer. Other major nutrients in green peas include fiber, vitamin K, manganese, vitamin C, vitamin B1, and other B vitamins. The following sweet pea soup recipe serves about four people. In a large pot, heat olive oil diluted with a small amount of filtered water over medium heat. Add garlic and green onions, and cook, stirring frequently until tender. Add two cups of water, and bring to a gentle boil. Toss in the peas, and reduce heat and simmer for about four minutes, or until tender. Next, add tarragon, and remove from heat. Add mint and the remaining one cup of water. Season with sea salt, pepper, and lemon juice. In a blender, puree until smooth. The soup can be served warm or chilled. Pour into bowls and garnish with almonds. Many creamy soups do not need dairy, and this zucchini-full St. Patrick’s Day soup recipe is a perfect example. Zucchini is an excellent source of manganese, vitamin C, magnesium, vitamin A, and fiber. Zucchini in general promotes bone health, heart health, and healthy weight control. The following zucchini recipe is paleo friendly and serves up to eight people. Cook the onion and zucchini in extra virgin olive oil over medium-low heat until the onion is translucent. Add the chopped garlic and cook for another minute. Add the broth and simmer for 15 minutes. Remove from the heat, and add salt and pepper to taste. Stir in the basil, cool the mixture down, and puree with high-speed blender in batches. You can serve the soup cold or hot. Broccoli and celery are responsible for the signature green color in this recipe. Broccoli, in particular, is rich in antioxidants like vitamin A and vitamin C. Celery contains a lot of potassium and fiber. The cashew cream will also make the soup creamy without using soy or dairy. In total, the broccoli recipe will take 30 minutes to make, and it will yield four servings. Chop up all the vegetables, and throw them in a pot. Add five cups of filtered water or a little more to cover your vegetables. Simmer for about 20 minutes, or until the carrots and broccoli stalks are tender. In a high-speed blender, blend a cup of water with cashews. Add the cashew blend to the soup, and stir. Clean the blender, and blend the soup until it is creamy and smooth. St. Patrick’s Day is largely associated with the color green, so to get into the St. Patrick’s Day spirit, try making a green soup. You can use the provided green soup ideas as a general guide. It is great to experiment with shades of green, and there are plenty of green foods that provide lots of phytonutrients and antioxidants that help fight and prevent disease. Some of my favorite green-colored foods include kale, zucchini, peas, avocado, cucumber, and broccoli. Other green vegetables that will give your St. Patrick’s Day soup a similar color include spinach, Swiss chard, rainbow chard, or leeks. McCarthy, J., Joyous Health: Eat and Live Well Without Dieting (Toronto: Penguin Group, 2014), 182. Daniluk, J., “Hot Detox: A 21-Day Anti-Inflammatory Program to Heal Your Gut and Cleanse Your Body (Toronto: HarperCollins Publishers Ltd., 2016), 204. McCarthy, J., Joyous Detox: Your Complete Plan and Cookbook to Be Vibrant Every Day (Toronto: Penguin Group, 2016), 166. Telpner, M., “Cashew Cream of Broccoli Soup,” Megham Telpner; http://www.meghantelpner.com/blog/cream-of-broccoli-get-on-top/, last accessed March 13, 2017. “Dairy-Free Zucchini Soup (Paleo, Whole30),” Primally Inspired; http://www.primallyinspired.com/dairy-free-zucchini-soup/#, last accessed March 13, 2017. Mateljan, G., The World’s Healthiest Foods: Essential Guide for the healthiest way of eating (Seattle: George Mateljan Foundation, 2007), 134, 188, 202, 286, 298. “Green peas,” The World’s Healthiest Foods; http://www.whfoods.com/genpage.php?tname=foodspice&dbid=55, last accessed March 13, 2017.